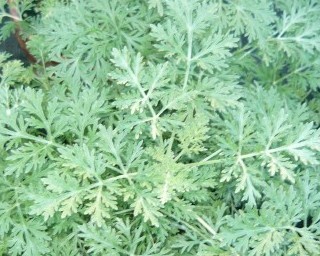 Artemesia "Powis Castle", also known as silver wormwood. Beautiful ornamental herb with silver lacy fernlike leaves makes an excellent contrast plant in the garden, very easy to grow and tolerant of poor soils and hot humid conditions. Beautiful plant for moon gardens and to add texture and color to the flower bed. Winter evergreen in warm climates. Perennial zones 7-9. Live plant in 3 inch container. I love the look of this plant. I have had for about 6 weeks and the plant has doubled in size. I take pieces off of the plant and place around my vegetable plants. This plant is a great companion plant and deters many pests.